A drain carries water but does little else, but imagine how different the neighbourhood would be if the drain could be transformed into a living stream. Lot sizes and backyards are shrinking in Australia at the same time as building density is increasing. So we cannot afford to overlook the potential of existing – but neglected – spaces in our suburbs, like drains. In denser living environments, we will need new types of green and open space to meet the needs of residents. One such overlooked space is the urban water drainage system. As part of my research I’m examining the potential of a co-ordinated and integrated network of suburban streams. Further reading: If planners understand it’s cool to green cities, what’s stopping them? 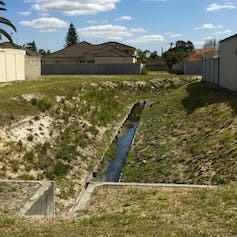 The largest water catchment in the Perth metropolitan area is Bayswater Brook (previously called the Bayswater Main Drain). 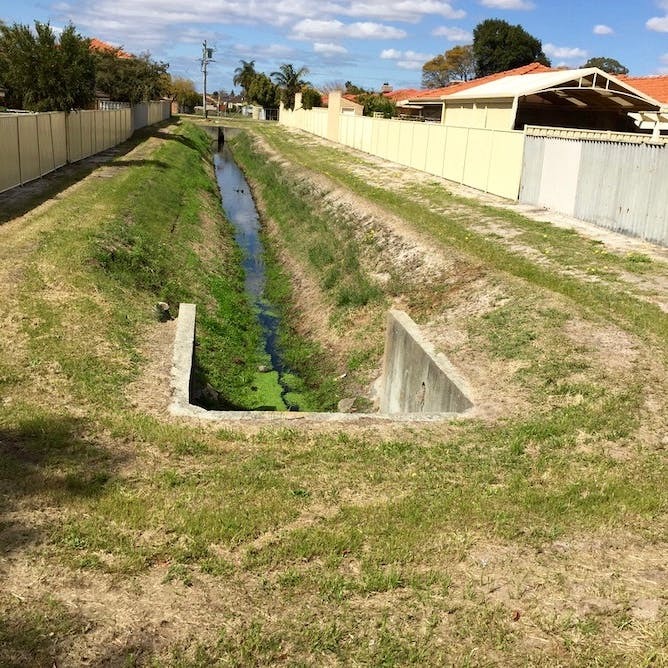 Largely for the purpose of improving water quality, in recent years work has begun to remake drains running through the suburbs into “living streams”. Aside from the obvious benefits of water purification and stormwater management, these networks of suburban streams can be re-imagined as preferred paths through the neighbourhood. 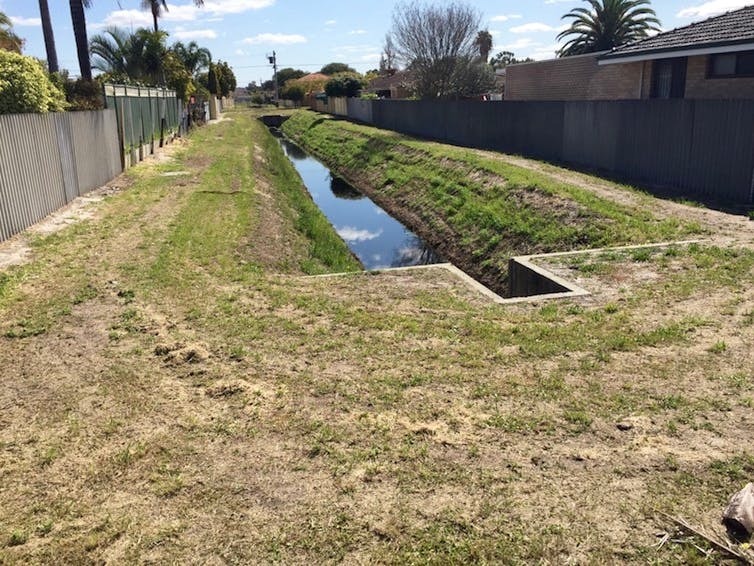 Using established drainage routes capitalises on their existing connections through a suburb. This network could amplify the connections between parks and other green areas, providing a rich soundscape of birds, frogs and insects, and a diversity of sedges, rushes, melaleucas and other vegetation along the banks. While the conversion of old infrastructure into living streams is not new, it has as-yet-unrealised potential to rehabilitate the large sections of open drainage that run in visible, connected ways through our suburbs. This elevates the idea of a living stream to a multi-layered ecosystem, one that includes multiple drains across the suburb. 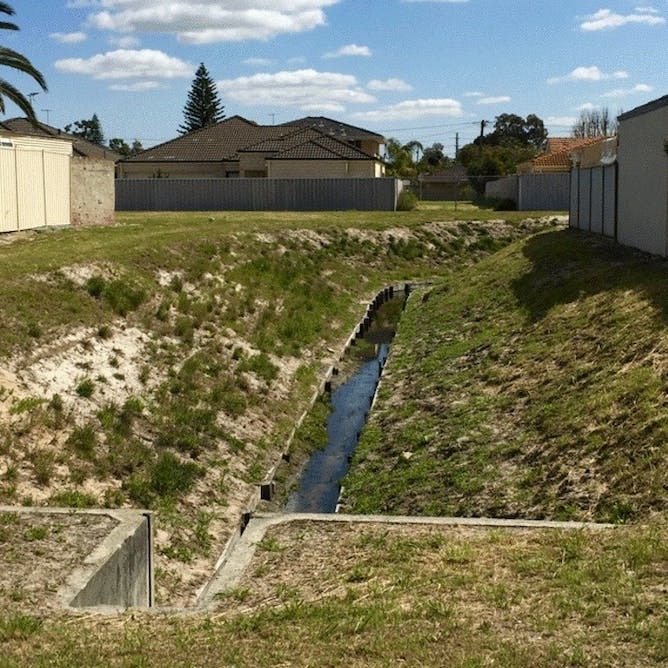 The Bayswater Brook permanent drainage system runs through the northeastern suburbs of Perth. These drains can be dangerous and public entry to these areas is prohibited out of necessity. Access barriers are unsightly but necessary because the existing drains can be dangerous. The drains run along the rear of mostly low-density housing, hidden from streets. 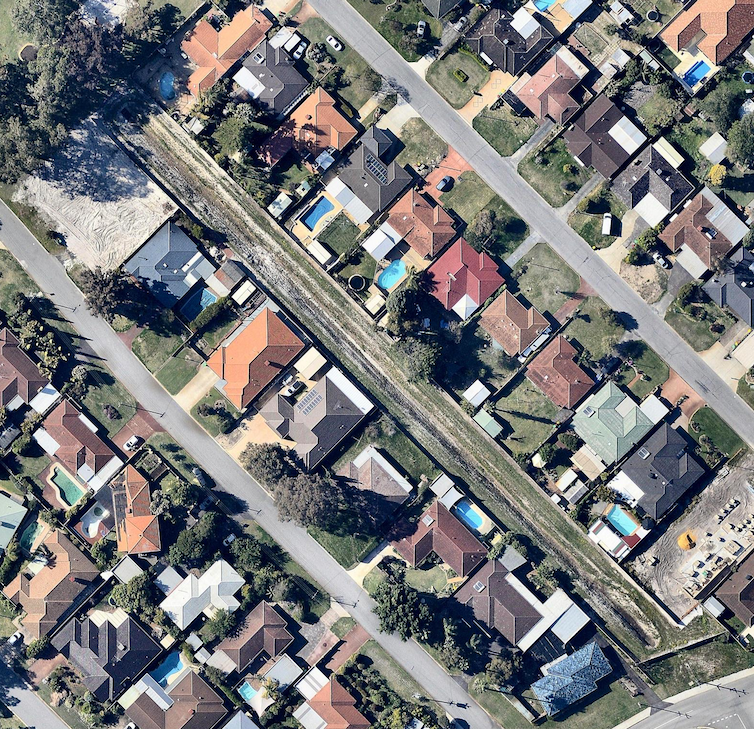 An aerial view of houses backing onto a 90-metre long open drain in Perth. Their condition is typically marked by weeds, minimal vegetation and stagnant water. Fenced-off areas offer no public benefits to the neighbourhood other than drainage. The sheer number of these open drains across the metropolitan area offers a compelling opportunity to reconceptualise the system as a holistic and integrated network of ecologically restored streams. This requires co-operation between multiple levels of government. 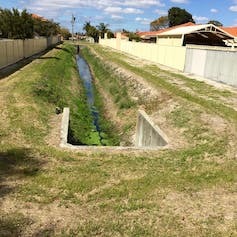 A project by WaterCorp in Western Australia (which manages drainage infrastructure) has begun inviting local governments to submit proposals for use of the green space around drains. 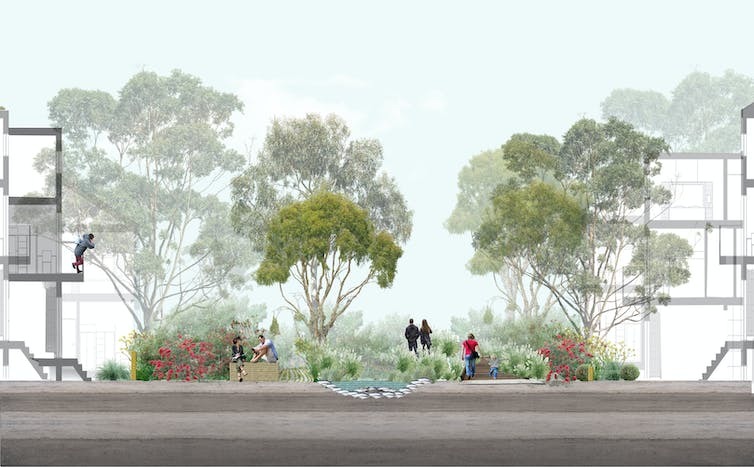 These are currently for small portions of the larger network, such as a pop-up park planned for a basin in Morley. The benefit of doing this in a co-ordinated way – rather than single stream restoration – lies in the possibilities of making these spaces a genuine alternative to the street. Typical drains (above and below) add very little to neighbourhood amenity. By activating unused, off-limits areas at the back of houses, we can turn public space “inside out”. Providing a sequence of accessible paths creates a new option for pedestrians away from roads and cars, but still with an established, clear route through the suburb. We can have a space that is buffered from traffic noise without the isolation of an empty park segregated from main thoroughfares. Many studies have convincingly found connections between the sounds of waterscapes and restorative emotional states and views. Having multiple entry and exit points as the streams thread through the suburbs would heighten the spaces’ usefulness as everyday pathways. Children could walk along the streams to school, or adults could take a short cut to catch the bus to work, maximising this kind of beneficial interaction with water. Recreating natural habitats would also increase biodiversity and create a multi-sensory environment, as well as a cooler micro-climate. That would make it an even more attractive place to be in hot months. Encouraging a more natural flow of water through the streams would also reduce biting midges and mosquitoes, which thrive in stagnant water. the trend increase for the area. This in turn can support increased density. High quality nature spaces potentially offset the sacrifice of the usual backyard area, by increasing the number of people with direct access to these spaces. Turning an urban drain into a living stream opens up a world of possibilities. There is a growing imperative to remove the false choice between designing for people or for nature. Remaking our old infrastructure for many new uses offers multiple benefits to our ecology and well-being. 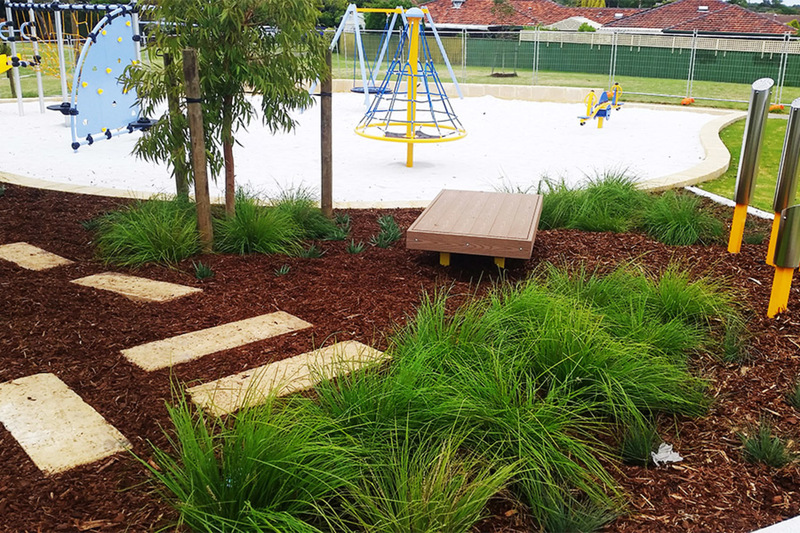 When a drain becomes a living stream it doesn’t just provide a new kind of open space but adds a new dimension to enjoying, and moving through, your suburb. As urban populations around the globe skyrocket and the demand for housing grows, space is increasingly at a premium in cities. Unfortunately, despite some notable efforts to include green space in cities, native wildlife is not often a priority for urban planners, despite research showing the benefits it brings to both people and ecosystems. It may seem that bringing biodiversity back into cities would require large areas of land set aside for habitat restoration. But it is possible to use relatively small spaces such as transport corridors, verges and the edges of sporting grounds. Think of it as “land sharing” rather than “land sparing”“. The idea of transforming public areas in cities into green space is not a new one. Allotment vegetable gardens, which have long been a staple of British suburban life, are enjoying a revival, as are community gardens in Australia. These gardens are obviously great for sustainable food production and community engagement. But we think similar efforts should be directed towards creating green spaces filled with native vegetation, so that local wildlife might thrive too. Cities can be hostile environments for wildlife, and although some rare species are still present in some cities, the destruction of habitats and growth of built-up areas has led to many localised extinctions. Often, species are left clinging on in particular reserves or habitat remnants. “Green corridors” through the built environment can link these habitat fragments together and help stop urban species from being marooned in small patches – and this is where native gardens can help. Cities are often built in fertile areas on coasts, and because of their fertility are often home to large numbers of species, which means that planting native vegetation in public spaces can potentially help a wide range of different species. A study in Melbourne found that native vegetation in urban green space is essential for conservation of native pollinators, as introduced plants only benefit introduced bees. But with the right habitat, even small mammals such as bandicoots can survive in urban areas. Native green space in cities can also be used to educate communities about their wildlife. Community gardens can be a very effective way to bring people together and create a sense of identity and cohesion within a community. Many people in cities have little or no contact with nature, and this “extinction of experience” can make them feel apathetic about conservation. Green space lets city dwellers connect with nature, and if these spaces contain native rather than introduced plants, they have the added benefit of familiarising people with their native flora, creating a stronger sense of cultural identity. There are many places in urban areas that can be tinkered with to encourage native species, with little or no disruption to their intended use. Picture the typical Australian park, for example: large expanses of grass and some isolated gum trees. Biodiverse systems are more complex, featuring tall trees, smaller ones, shrubs, herbs and grasses, which together create diverse habitat for a range of species. So by building native garden beds around single trees, at the park’s edges, or within designated areas (even among playgrounds! ), we can gain complex layers of habitats for our native animals without losing too much picnic space. We think of verges as places to park our cars or wheelie bins, but these grass borders are another underused area where we could plant native gardens. This not only improves the aesthetics of the streetscape but also reduces water use and the need to mow. 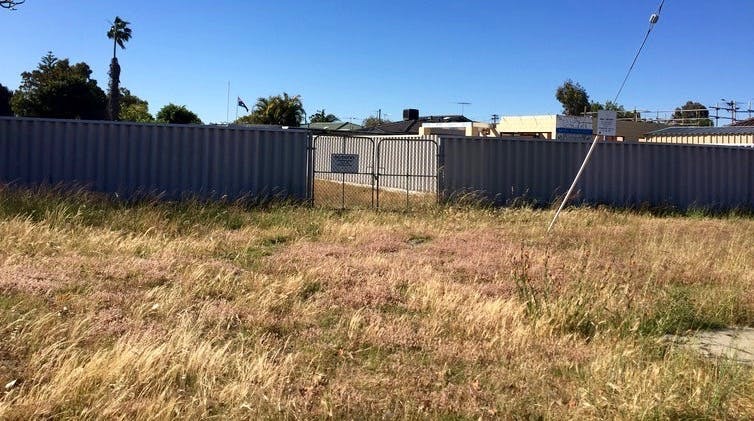 Australia is a sporting nation and our sports grounds are cherished features of the urban landscape, yet there are plenty of opportunities here for native vegetation. The average golf course, for instance, only uses two-thirds of its area for actual golf (unless you’re a very bad shot). The out-of-bounds areas nestled between the fairways offer plenty of space for native biodiversity. Likewise, the boundaries of sporting ovals are ideal locations for native vegetation borders. Even infrastructure corridors such as train lines, electricity corridors, and the edges of highways have the potential to contribute to the functioning of local ecosystems. As the existence of community gardens and Landcare groups shows, there is already a drive within local communities to make these ideas a reality. In fact, some groups of “guerrilla gardeners” are so passionate about urban greening that they dedicate their own time and resources towards creating green public space, often without permission. But urban gardening doesn’t need to be illegal. 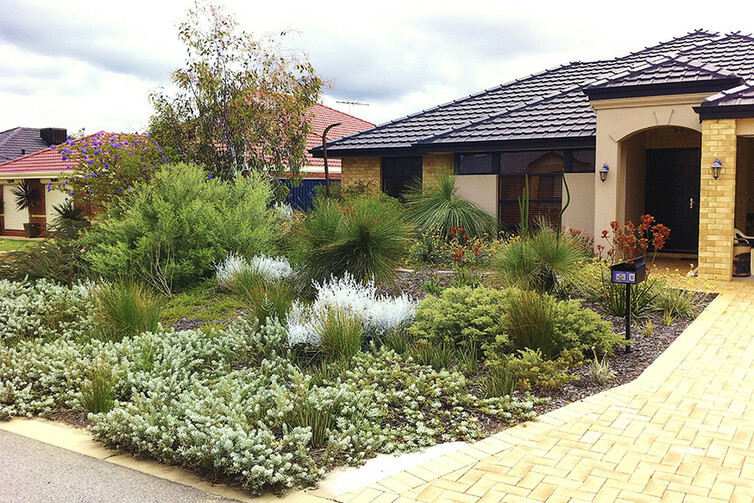 Many councils in Australia have policies that encourage the planting of native plants in private gardens, with some even offering rebates for native landscaping projects. Ultimately we need to both share and spare urban landscapes. By conserving habitat fragments and planting native gardens to connect these patches, we can bring native plants and animals back into our cities.